This is a webinar course for learners who want to learn chanting the Bhagavad-Gītā perfectly with adherence to the rules of Sanskrit grammar. The focus will be on chanting, with spaṣṭatā (clarity in pronunciation), rāga (tune), splitting of words (Sandhi) and overall presentation. All 18 chapters will be covered, along with the Dhyānaślokas. Special Focus on pronunciation and chanting. 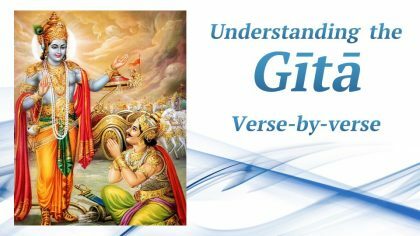 Appropriate split-points will be mentioned for each verse, in conjunction with the meaning and rules of Sanskrit grammar. Live interaction and feedback from a trained teacher. Interested learners of all age groups, who wish to learn the verses of Gītā and improve their pronunciation skills. Those who are preparing for Gītā chanting competitions conducted by various organisations will also be benefitted by attending this course. Schedule of Classes – Every Saturday, 7:30 AM to 8:30 AM IST. 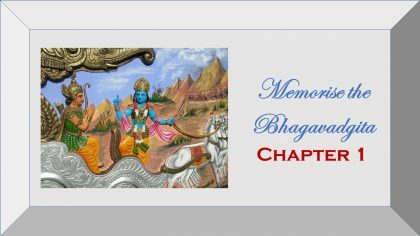 The Bhagavadgītā is one of the most prominent and the most celebrated scriptures of Sanātana Dharma. An evergreen work, it is a source of inspiration for people in all walks of life. Many great scholars and thinkers the world over have been inspired by the Gītā. The scripture contains 700 ślokas, categorised under 18 chapters. The participants in this course would be trained to chant all the Gītā ślokas with accurate pronunciation. One can repeat the ślokas taught and memorise them as well. The learners get introduced to the methods of chanting Sanskrit ślokas according to the chandas (metrics), Sandhi and Yati. The course also offers an opportunity for live interaction with the teacher to clear doubts if any in pronunciation and regarding the authentic versions of the ślokas. 1. Who is this course meant for? The course is meant for all who want to learn chanting the Gītā ślokas in an authentic way, and for those who want to memorise the entire Gītā. Chanting is the first step towards undertaking deeper spiritual inquiry and self-discovery by understanding the meaning of the Gītā. 2. I want to learn specific chapters for a competition. Will that be taught to me? This course will cover the chapters of the Gītā in order, starting from Chapter 1 after completing the Dhyāna ślokas. You can join the class and learn the portions in the order taught there. If you want specific, personalised coaching for any competitions, please write to us at support@vyomalabs.in to know about our paid one-on-one courses. 3. Will I get individual attention from the teacher? The teacher will teach the verses, and select a few students to repeat the ślokas as she teaches. Others are expected to repeat along with these students and learn. There will be opportunities to ask if you have any questions/doubts. In every class, students will also be given a chance to recite previously taught ślokas. In case there are many students taking part, the teacher will try to ensure that all students get a chance in order. If, due to time constraints, all students cannot be accommodated in a single class, they may be given an opportunity to chant in the next few classes. 4. Will the course ensure that I memorise all the verses of the Gītā? By the grace of Bhagavān, the teacher will try to teach all the verses of the Gītā over the course of about 2 years, and will provide periodic feedback on your pronunciation if you volunteer to take part in chanting verses during the class. Main focus of the class will be on ensuring good pronunciation. If you participate in all classroom activities and practice diligently after each class, you will be able to chant the verses without mistakes. Memorising the verses will depend on your own effort. 1. How are the classes conducted? The classes are conducted online through a tool called Gotowebinar. Students can join the classes through their computers or smartphones. 2. Are the classes live or pre-recorded? The classes are live, conducted at the time announced above. After each class, recording of the class will be uploaded on the portal. Those who cannot attend the live classes can catch up through the recordings. 3. Will there be opportunity for interacting with the teacher? Definitely. You can clear any of your doubts/pose questions to the teacher directly during the classes. The classes will also be conducted in an interactive manner. 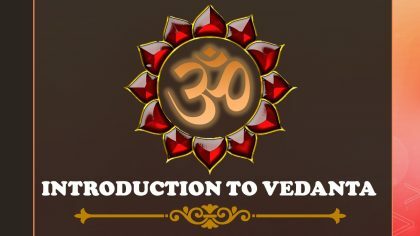 You can participate in chanting practice in the live classes, and get feedback on your pronunciation from the teacher. Classes will be held once in a week Every Saturday, between 7:30 AM and 8:30 AM IST. First class will be on 20th April 2019. The course will be for a duration of 2 years (Approx.). 2. Is attendance compulsory? What if I miss a class in the middle of the course? Regularity and punctuality are very important in gaining the full benefits of the course. However, if you have to miss some classes due to unavoidable circumstances, please inform the teacher by email in advance. You can catch up with the class using the uploaded materials. 3. I came to know of this course late, and a few classes have already happened? What do I do? You can start attending the live webinars, and catch up with previous classes using recordings. Log in to your account and navigate to this course. Click the ‘Take this Course’ option below this course description (Red coloured button). This will register you for the webinars, and allow you to access all materials of the course. Scroll down and click on the “Register for the Live Webinars” link to register for the live webinar classes. Visit www.sanskritfromhome.in/register to register for the portal and choose a username and password for yourself. Activate your registration using the link in your confirmation email. [The email will be sent to the id that you provide during registration. If you cannot find the email, please check your Spam folders]. 1. What is the fee for this course? This course is absolutely free! The only things you need to invest are your interest and commitment to attend the classes regularly and participate in the activities. 2. What is the language used in the classes? The interaction will be predominantly in English, interspersed with Sanskrit. The verses displayed on the screen during the webinar will be in Devanagari script. The course will be taught by Smt. 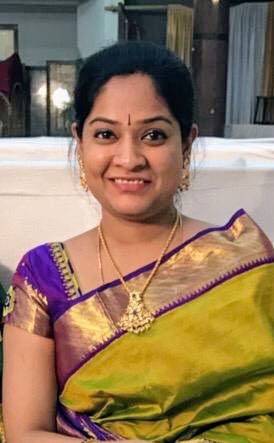 Brunda Karanam. Experience in acting and singing in Sanskrit plays. Students are expected to possess their own copy of the Bhagavadgītā books. Editions of the Bhagavadgītā published by Gita Press, Gorakhpur, are recommended. To join, Click on the Red coloured “Take this Course” Button below, and then scroll down to register for the live webinar.